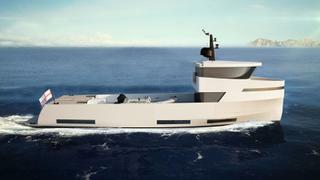 Chantier Naval Chioggia has been announced as the build partner for the Naucrates 85, a 26.6 metre superyacht support vessel created by Italian design studio Green Yachts, which has the potential to transform into a motor yacht with capacity for up to eight guests. 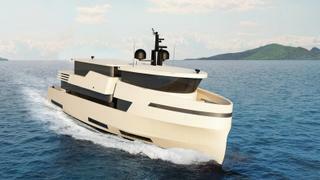 Power would come from a pair of MAN diesel engines to propel the Naucrates 85 to a top speed of 12 knots and a total fuel capacity of 39,500 litres should ensure extended cruising potential at 10.5 knots. The crew quarters allows for a staff of up to four people in two cabins, while the superyacht wheelhouse would boast a large seating area for those who want to enjoy the best views underway. The superyacht support vessel version (pictured below) boasts a completely open aft deck, ideal for carrying tenders, dinghies, Jet Skis, helicopters or even cars. Folding gunwhales and a central lifting crane add further practicality. Despite its primary purpose as a superyacht support vessel, the Naucrates 85 platform can also be fitted out as a compact superyacht, using a superstructure extension called the "easy plug system" that gives scope to add accommodation for up to eight guests split across three cabins. 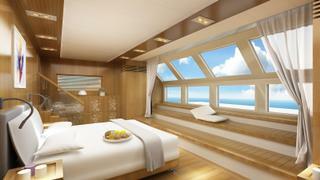 The rendering above shows an initial design for the master cabin, which was developed following significant client interest. Other superyacht projects currently under developed at the Italian yard include the 40.25 metre Ocean King 130 yacht Genesia, which is due to receive a public debut at the Monaco Yacht Show 2017.